Were you one of the thousands who marched in Cork for the Palestinians, during Israel’s attack on Gaza this summer? If so, we’d like to invite you to celebrate that solidarity, and help us launch our 2015 calendar, at an event we’re hosting at the Imperial Hotel, South Mall, Cork – on Sunday 14th December between 3.00pm – 5.00pm. Attending will be some distinguished guests of honour: the Palestinian Ambassador and his wife – and Dervla Murphy, the famous writer, who has written several books on Palestine. At 4.00pm there will be a brief ceremony and press photographs when the Ambassador will thank the people of Cork for their solidarity, then, together with Dervla Murphy, mark the official launch of our 2015 Calendar. Bring the children – we’ll have entertainment for them and goody-bags, while, for the adults there will be glasses of mulled wine (with or without alcohol), for a small donation. And, with hundreds of images and video taken during the marches, being projected, you can re-live those summer days of solidarity. If you spot yourself and want a copy of the photograph made, there’ll be a book of thumbnail copies and you can order a print to be made. To help us plan our space needs, please let us know if you can attend – and how many will be in your party. Just hit the ‘reply’ button on your email and send a simple message indicating how many adults and children will be in your group. At just €5, the calendar is very good value. Of course, it includes the usual information you would expect from a calendar, as well as beautiful photography (by Stephen Bean). But it is much more than a calendar. It is a useful tool to help you (and your friends) to help the Palestinian people. 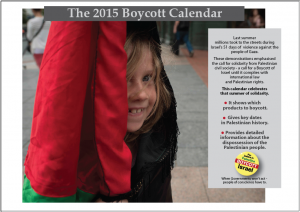 Month by month, it identifies Israeli products most likely to be in the shops and, each month, it highlight key dates in the history of the dispossession of the Palestinians – these events are explained in a six-page illustrated chronology which is included with the calendar. Each calendar is supplied with an envelope, so it’s simple and inexpensive to send them out to others for Christmas. We look forward to hearing from you – and seeing you on Sunday 14th.